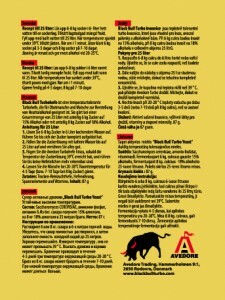 Black Bull Turbo is not the best Turbo Yeast in the world. In the business, everyone knows there are no better Turbo Yeasts then ones from Gert Strand in Sweden. To make a Turbo Yeast better is hard – and costly. So Black Bull Turbo Yeast is – in our opinion – the second best Turbo Yeast in the world. What Black Bull Turbo Yeast gives you is great quality at a low price. – High alcohol tolerant – up to 18% alcohol by volume. – High osmo tolerant – can withstand high osmotic pressure (thick mash). – Has low weight – 87 gram net – low freight cost. – Is bacterium free – bacteria will not contaminate the mash. Here you have a list of Turbo Yeast secrets that is hidden for consumers in the business. It is so good that there is nothing better in the world. Despite that Gert Strand (allfreightfree.com, partymanshop.com, partyman.se) is probably the smallest producer in the world for consumer Turbo Yeast. Because consumers can not measure the difference and select the best. In distillery business (the site is distillery-yeast.com) it is a little difference, there Strand have no competition from the hobby Turbo producers – because distilleries have HPLC, gascromatography and other analyze methods. This is their secret – they pack professional products in consumer size sachets. Gert Strand have published huge amount of information to show the quality difference – like turbo-yeast.com but it seems to have no influence. Consumers ask in their shop who recommends the most profitable yeast – for him. This is because Australian recipes are different – easiest recognized by the high weight of Australian Turbo Yeast, often 240 gram. Nitrogen nutrients differs and that lowers the temperature tolerance. Fermentation reach killing temperature 3-4C earlier and yeast dies. Despite this almost all brands in Australia claims they have a 20% alcohol Turbo Yeast and do not tell that air temperature have to be 25C or less, some brands even lower. While Black Bull Turbo yeast is a multi Turbo that can be used for everything except fermenting 20%, there is generally several types of Turbo Yeast. While developing Black Bull Turbo we tested hundreds of Turbo and found out. Some Turbo Yeast produce close to no methanol during fermentation. Turbo Pure 48 is the extreme here and was originally developed for the Amazing Still. A vapor still, does not distill, it vaporizes, no cooling needed, no look after needed, extremely pure alcohol – but it take 3 days. 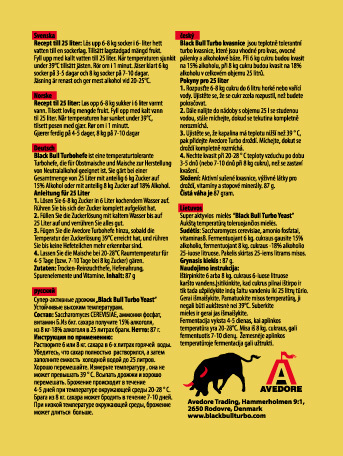 Turbo Pure 48 yeast strain has the highest temperature tolerance in the world (Black Bull Turbo strain is second). Turbo Pure 48 can also ferment dextrose to 20-21% alcohol by volume. But is is not that good to ferment fruit Schnapps, have harder to get the fruit flavors from the fruit over to the mash. On the other hand Turbo Pure 48 can make a 20% alcobase that can be flavored and colored to a RTD – Ready To Drink drink. Black Bull Turbo yeast can also ferment alcobase – but only to 18%. Those are a lot cheaper to produce as some of the expensive micro nutrients are not needed. Those Turbo ferment 6 kg sugar in a 25 liter fermentation to 14.5% alcohol by volume. Some of those Turbo yeasts are not good and some are not temperature tolerant. The best one are Black label Turbo and Prestige batch. But those are a bit overkill, they can ferment larger batches and also ferment 7 kg sugar. This is because the higher the alcohol fermented, the more stress on the yeast. The more stress, the more by products is produced. If you ferment 6 kg sugar in a 25 liter fermentation with Black Bull Turbo Yeast it will be much purer then if 7 kg or 8 kg is fermented. But more volatiles and off flavor/smell can be removed with more activated carbon after distillation. Black Bull Turbo yeast does not sneak in “Turbo Pure” in the name to steal goodwill. 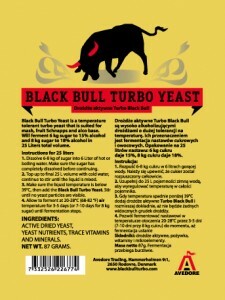 Black Bull Turbo yeast goal is to be second best in the world.